Bomberbot offers comprehensive tools for teaching and developing digital skills in a simple and fun way. Today’s children grow in a world that is increasingly influenced by technology. However, majority of them do not understand how technology actually works and how we, as humans, can program machines. 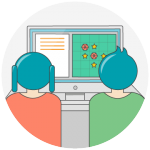 Bomberbot is a digital learning tool that helps teachers teach kids aged 8 to 14 computational thinking skills and basic programming concepts in a fun, accessible way. Easy-to-use teaching materials packed with online and offline activities. See an example of a lesson plan here. Students get to apply learned concepts in an engaging way. Sign up for a free trial to try the game. Our customer support is always available to help you through phone, chat and email.